HALLOWEEN SKIT COLLECTION: Why are pirates so funny? They just arrgh! In this hilarious Halloween show, the audience gets to help Captain Cackle choose which pirate has the best (and worst!) 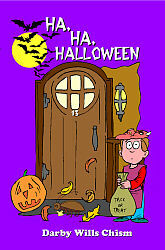 joke, learn how the jack-o’-lantern came to be, discover the secret to getting more candy on Halloween, uncover the truth about the candy corn curse, and find out why two huge cockroaches are living in Mrs. Betty’s cupboard. Suitable for all ages, these easy-to-produce skits can be either performed as an alternative to a haunted house or can be incorporated into a haunted house experience. Darby Wills Chism teaches art and drama at the Kennesaw Community Center and has worked as a preschool teacher, an art-enrichment instructor, and an art specialist. Ms. Chism lives in her hometown of Marietta, GA, with her husband, David, and their children, Rebecca and Wyatt.